It’s taper time! I just did my last 20-miler of my marathon training schedule, so it’s time to rest and recover in preparation for the actual race on June 16th! This will be my 5th marathon, and this training season is the best I have had yet! When I came to Indonesia two years ago, I intended to run a marathon in Asia and in Australia (which would have brought my continent tally up to 5!) I had spent the previous two years training half- and full-marathons, but I was constantly injured with one thing or another. I was always sore and exhausted after long runs. I had a lingering ankle injury, knee pain, and was always one old pair of shoes or concrete sidewalk away from shin splints. Luckily (luckily?) 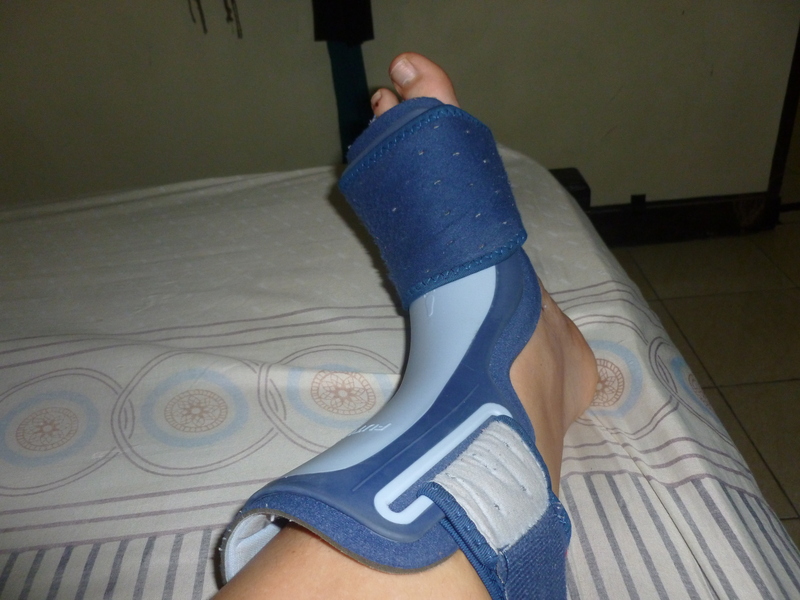 I sprained my ankle pretty badly within my first month here, and my plans to continue running marathons went out the window. Until I started this training season, I hadn’t run farther than 10 miles, and that break from distance helped a lot. I also started doing triathlons, so kept up aerobic fitness by biking and swimming. The first morning I ran with MIT, the my marathon training club in Columbus, I went to the guy in charge and said “I’m new.” “How fast do you run?” he asked. “Maybe nine or ten minute miles?” I guessed. He sent me to the 9:30 pace group, which I stuck with because I developed a huge crush on the coach. After two seasons, I ended up with an ankle injury and a broken heart. (The ankle took longer to heal.) Those two races are still my half-and full-marathon PRs, so we’ll call it even. I eventually dropped back to the 10:00 group, and now that I am running alone, I do more like an 11-minute mile on long training runs. This is what the experts recommend – you should run long runs one or two minutes slower than your goal pace. I’m not too worried about goal pace (I approach marathons with a pass/fail mentality), but I do know this is a better pace for me. For better or worse, Indonesia is kinda a buzz-kill. Us foreigners are lucky if we live somewhere where you can buy alcohol, and even then, pretty much all you can find is cans of beer or bottles of Smirnoff ice for $3 apiece in the mini-marts. Indonesia is not a drinking culture, and alcohol is taxed very heavily. I basically have stopped drinking just because I don’t have the opportunity. Compare this to life at home, where I would typically have a few drinks with friends 2-3 times a week. Giving up alcohol, I may have just acquired another addiction – I’ve been getting about 2 massages a week. Why not, when each session costs under $10, and there are so many varieties – standard body massage, hot stone, aromatherapy, Japanese chiropractic, body reflexology, foot reflexology, and the magical “cream bath” which is really a deep conditioning treatment for your hair, but also includes an arm, shoulder, and head massage. So I’ve had a massage regimen like that of an elite athlete. I’m all loosened up. The best is foot reflexology, where they dig into your feet and release all the gunk that I imagine builds up there after a few hours of running. Since 2009, I’ve spent 15 minutes most mornings attached to a giant rubber band faithfully doing exercises given to me by a physical therapist after I first injured my ankle. I varied it a little and added in other exercises, and, to be honest, slacked off quite a bit once my mileage got high in recent months. But I think I have increased foot and leg strength. I really noticed it when hiking down Mt. Merapi with Katie and Chris a few weeks ago, when I easily caught myself on ankle-turning stumbles that, in the past, might have put me out of commission. I got ‘em just before my health insurance ran out two years ago, and, given that in Indonesia, I have no shame wearing grandma shoes, I have worn them almost everyday. So my arches are supported and happy. I know that the new barefoot movement advocates less support in order to strengthen feet, so I don’t know if they are helping or not. I’m just going to continue wearing the things until America convinces me that uncomfortable shoes are beautiful and worth the pain again. I’ve started running in Newtons, which encourage you to run with a (currently trendy) toe strike. 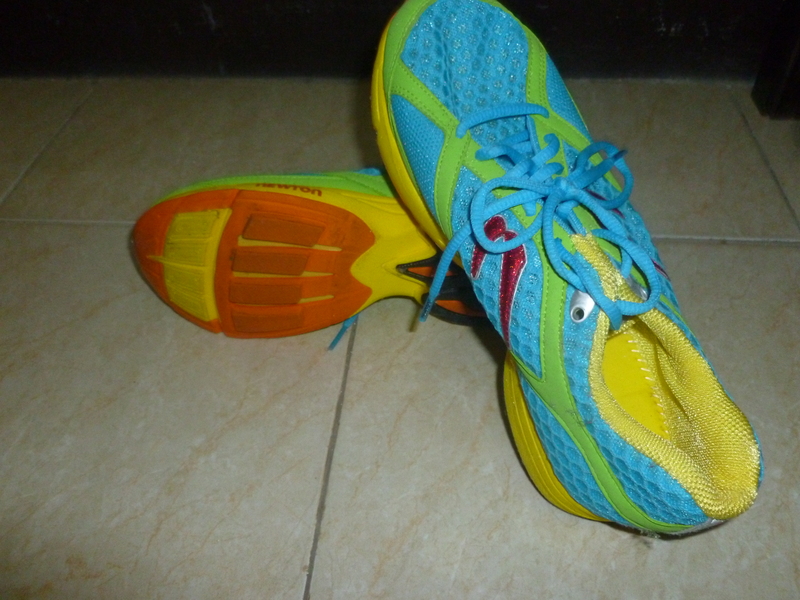 They have changed my stride when running in regular shoes as well. Some running experts say there is no need to mess with your stride, but all I know is, I am less injured. In fact, the only injuries I could possible link to toe striking are two matching blisters below the ball of my foot where my body created new skin at the spot where my foot now hits the ground. Even if it doesn’t help my running, at least it will make runner-types think I am cool. I read this article in Runners World: I did it. I liked it. If only because counting my breaths gave me something to do on those long runs alone. I noticed that my ankle tended to tighten up overnight, so I invested in this torture device to keep it in a flexed position. This is actually made for Plantar Fasciitis, but it works great for my ankle tendons as well. And is actually quite comfortable. Though, if I ever get a boyfriend, I’ll probably keep this hidden (along with my mouth guard) until I get married. Or have children. Or grandchildren. It is probably tempting fate to write about how awesome it is to be uninjured going into a marathon that is still over two weeks away. Let’s hope for no motorcycle accidents or ankle twists. I intend to focus the reminder of my training on eating sufficient pasta. Wish me luck! One of the best parts of living somewhere 12 hours ahead is waking up in the morning and scrolling through my facebook feed to see what my friends in America did yesterday. Today was not a good morning. Last night, as I went to bed, I saw pictures of friends from my running group as they were preparing to run the Boston Marathon, the country’s oldest and most iconic race. People train hard for years to qualify for Boston. Even if we know we’ll never qualify, we still think about the possibility (if I had a great day…; If I could lose 15 pounds..; If I can still run this fast when I’m 70…). We know random facts about a race course we have never seen (10 AM start in Hopkinton; Newton Hills between miles 19 and 26). Based on my age and gender, I would have to run a 3:35 marathon to qualify. That will never happen, but for my friends who are just a little faster and a lot more competitive, it’s within the realm of possibility. This morning, I was excited to wake up and see how they had done in yesterdays race. And, of course, the first thing I saw was the terrible news of 2 bombs at the finish line. For some reason, when people hear about a senseless act of violence, we want to find a connection to our own lives. Maybe it’s human compassion, maybe it’s voyeurism, but we want to take someone else’s tragedy and make it our own. We update our facebook status, we tweet: We are all Virginia Tech; Praying for Sandy Hook families; Those could have been my friends; That could have been my child. We want to be part of it, and somehow we feel like we are. People here in Indonesia feel the same way, and often, I am their connection. For many of my students and colleagues, I am the only American they know well, or even the only American they have ever met. When a tragedy occurs in the States, they often seek me out. “We are sorry to hear the news,” they say. “Are your family and friends okay?” Usually, my family and friends are hundreds of miles away – many Indonesians don’t know New York from New Mexico. I let this slide since many Americans don’t know that Sumatra and Java are more than coffees at Starbucks. But, by being able to connect with me, an actual American, they feel a connection with the tragedy, and they have a conduit for their condolences. Of course today, some of my friends were there, had passed the exact bombing site only minutes before. And even more of my friends felt like they were there. People come to run Boston from all over the country. I would bet that any distance runner in the US who runs with a group knows at least one runner in Boston today, and immediately thought of that friend. Actually, many of them had already been thinking of those friends all morning as they ran the 26.2 miles from Hopkinton to Copley Square, mentally sending luck and encouragement. We think about them going to the expo while we are doing our own long run Saturday morning. We see Facebook pictures of them having their pre-run pasta on Sunday night. We post good luck comments on the picture of them on the bus that morning. We follow their progress online. A little bit of us is there too. So when we imagine their finish line excitement and triumph turning into tragedy, we feel that, too. I feel a little bit sheepish saying this about something as secular as a foot race, but there is something sacred about the finish line. I always cry as I cross. I’m not sure if that is because I’m proud of my accomplishment, overcome with endorphins, or just happy I don’t have to run anymore. The feeling of finishing a marathon is an incredible peak experience. You think back to the long months of training, to the runs in the snow and the rain and the sunshine. You think about other things in your life you are proud of and of what you still have to accomplish. You think about all the people that supported you, all the people who love you, and all the people that you love. It’s a thin place, a place where you are more connected to the fundamental magic of the universe. To have that feeling changed to fear and tragedy in one second is unpardonable. Living in Indonesia, among a Muslim society, there is a phrase I have come to love: Alhamdulillah. It’s roughly translated as “Praise be to God,” but that doesn’t have the same ring to me. Muslims continue to recite the Koran in the original Arabic because of the power and the beauty of that language, and that may be why Alhamdullilah just seems more powerful than “Thank God” or “Praise Jesus.” So that’s what came to my mind. When I read the e-mail from Marathoners in Training (MIT), my running group in Columbus, saying that all the runners from our group were safe. When I thought about my friend Debbie, who has tried for years to qualify and missed it last year by a maddening 26 seconds. I know that many people think of Islam when they think of terrorism, and that is a sad and unfortunate connection. But after two years of living in a Muslim society, among some of the kindest and most thoughtful people I have ever met, I do too – as a source of comfort.